Tie Domi hasn’t played for the Rangers in over two decades, but he remains one of the most popular members of the Blueshirts alumni. Fans loved his fearless attitude and his ability to stick up for his teammates often against players bigger than his 5-foot-10 frame. NYRangers.com recently caught up with the NHL’s leader in fighting majors to talk about his time in New York, the way he played the game and what keeps him busy in retirement. You spent three seasons with the Rangers. Favorite moment in New York? TD: I was really figuring out my life and my career. I was living the dream. It was pretty cool to start my career in New York City. I learned as I went. I wouldn’t want my kids doing it that way [laughing], but it was a special time and a moment I’ve cherished for the rest of my life. The friendships and the bonds that I built while I was here I’ll never forget. Fans still tell you you were their favorite player, and you always get a warm reception when you pop by. How special is that for you? TD: I actually went to a function the other day at Pier 60 for for [multiple sclerosis] and my friend was being honored and they said I was there and when they mentioned I was there, the fans cheered really loud. There were Giants and there were Jets and there were other New York athletes. I haven’t done that in New York in a long time. It was a great feeling. It was so long ago but it feels like yesterday when people remember you and cheer you. I’ll always cherish those moments when fans come up to you. I feel blessed. There are very fond memories of not just my career, but starting my career in New York was a special thing. You were a pretty feared player with some legendary bouts over the course of your career. How much pride did you take in filling that role on your team? TD: That was honestly something that the guys in my era – we only knew one way. The guys that did what I did we all share that brotherhood that we dressed every game thinking we may have to take care of our teammates. That was our responsibility and those were our roles, to make guys accountable. We policed the game. That’s what I did. 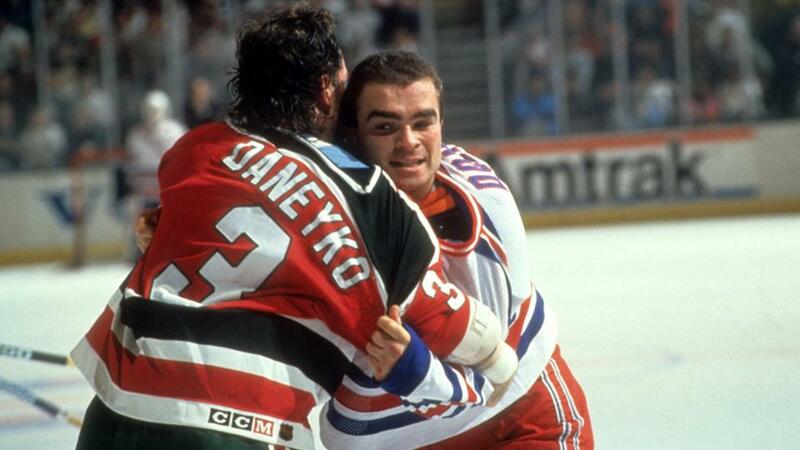 The game obviously has changed, but having the most fights in NHL history is a record that I guess won’t be broken now. There were a couple of those with [Bob] Probert that were probably lifted up for, but the rest were either for my teammates or my team, whether it was protecting someone or changing the momentum of the game. That’s the only way we knew how to play the game. Our mentality was just different back then. It’s just a total different game [today], and I think for the better. Aside from watching your son Max with the Coyotes, what are you doing to keep busy now that your playing days have ended? TD: I’ve got three kids so I’m focusing on my kids. I consult for some companies that I feel comfortable with and that I know I can bring value to. I’ve been around a while. I’ve been in the business world pretty much my whole career. I started doing business when my dad died and I was playing for the Rangers. After that summer I started in business. I’ve worn a lot of different hats and have done a lot of different things. At this stage in my life, my kids are my focus. Obviously my son [in Arizona], and I have two daughters that are just as important to me. I have to balance all three and try and give them guidance the best way that I can.